OSU junior attacker J.T. 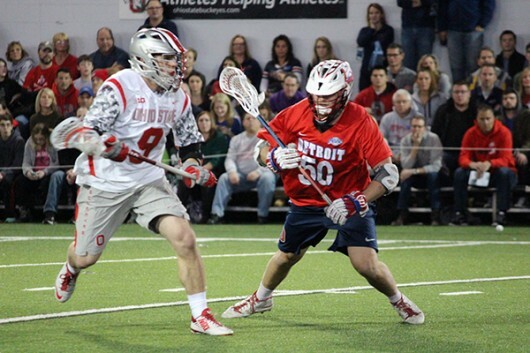 Blubaugh (9) during a game against Detroit on Feb. 13 at the Woody Hayes Athletic Center. The offense came a little too late for the Ohio State men’s lacrosse team on Saturday, as the Buckeyes fell to No. 13 Hofstra by a score of 8-5. After a defensive struggle throughout the first three quarters, the OSU offense came alive in the fourth with three goals. However, the Pride matched them goal for goal in the period, handing the Scarlet and Gray their second loss of the season to bring their record to 5-2. The Buckeyes’ only two goals in the first three periods came from freshman attacker Jack Jasinski in the first quarter on an assist from junior attacker Austin Shanks and senior attacker Ryan Hunter in the second quarter on an assist from Jasinski. OSU was only able to attempt 10 shots in the first two quarters combined. Although the Buckeyes were able to match that number in the third quarter alone, they were unable to find the back of the net in the period. Much of that was because of the play of Hofstra goalie Jack Concannon. The sophomore, who came into Saturday’s game ranked fifth in the nation with a save percentage of 62.8 percent, had 14 saves on the day and stifled the OSU offense for much of the game. The play of the defense was a bright spot for the Buckeyes. Hofstra senior attacker and 2016 Colonial Athletic Association Preseason Player of the Year Sam Llinares was held scoreless on the day on four shot attempts. OSU senior defenseman Robby Haus was able to limit Llinares’ impact on the game, usually with the help of a double team. Though Llinares was held in check, Hofstra junior attacker Josh Byrne scored two goals to bring his team-high number of goals on the year to 16. Junior midfielder Brian von Bargen scored three goals and senior midfielder Korey Hendrickson added two more, in large part due to the increased attention paid to Llinares and Byrne. Hunter added his second goal of the game for OSU with 11:06 left in the fourth quarter to cut the deficit to 6-4, but a pair of Hofstra goals sealed the game for the Pride. OSU is set to get a chance to bounce back on Tuesday after a few days’ rest, but things don’t appear to get any easier. The Buckeyes are slated to play the No. 6 Towson Tigers at Ohio Stadium at 7 p.m., before traveling to Colorado to take on the No. 2 Denver Pioneers on March 12.